At Oakland E.N.T. our audiology / hearing aid services are widespread. Hearing aids are all fitted with a 30 day trial period, so you have ample time to assess if the hearing aid being tried is best for you. Our audiologist, Eileen Shevin-Finck, is active in continuing education. She has a variety of the latest hearing aids in stock, representing the very best in currently available hearing technology. We want you to be happy with your choice. The right amplification can cause a huge improvement in the quality of life and communication! Eileen received both her Bachelors degree and Masters degree in Audiology from Michigan State University, and completed her Internship in the metropolitan Detroit area. She went on to complete a Specialist degree in Gerontology from the University of Michigan. She is involved with working with the elderly in the community providing hearing screenings and hearing aid services. 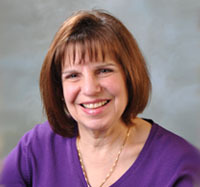 Eileen is a licensed hearing aid specialist who is committed to continuing education. She works with the latest hearing aid technology. Eileen has been with the practice for over 20 years. She is a member of the American Speech and Hearing Association.